Coun Georgina Hill, chairman of the audit committee. Northumberland County Council’s lack of powers in relation to town and parish councils – even where there are concerns about wrongdoing – has been reiterated. An information report on the sector went before last week’s meeting of the authority’s audit committee, which had been sent a letter from an individual complaining about the lack of action in relation to a specific parish council. However, the report underlined the fact that the county council is ‘a separate and distinct body’ to the town and parish councils within Northumberland. Its remit with regard to town and parish councils only extends to two limited areas. It has to levy and collect any precept notified to the county council by the town or parish council, and pass this funding on. The other requirement, introduced under the Localism Act 2011, is for the monitoring officer to establish and maintain a register of members’ interests and to consider allegations of misconduct against parish and town councillors in Northumberland. Chairman, Coun Georgina Hill, who had requested the report, said: “The advice from audit, the monitoring officer, NALC (the body representing town and parish councils) and others is that there’s not much we can do about it. Coun Hill added that there were issues at a number of councils, not just in Northumberland, and other committee members also expressed concerns. 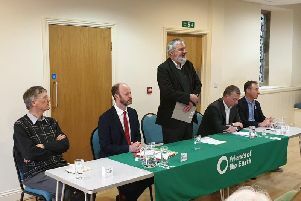 But Coun Hill pointed out that while it is clear-cut with a county council who the administration is, sometimes in parish councils that are not party-political, it’s not always possible to tell who is part of a particular ‘clique’. The committee agreed to write to the Ministry of Housing, Communities and Local Government to express its concerns. She added that spending £5,000 a year out of an £80,000 annual budget for a service from Northumberland County Council was material for the parish council, but not for the county council. A representative of external auditors EY said that similar issues had been raised with them as an objection on the council’s 2017-18 financial statements earlier this year, but they concluded it was not valid for similar reasons. A public interest report highlighting governance concerns in relation to the years ending March 31, 2016 and 2017 at Rothbury Parish Council was published in January this year.